Chemical, physical and thermal properties of benzene, also called benzol. Phase diagram included. Benzene, C6H6, is a clear colorless to light-yellow liquid, flammable with a petroleum-like, aromatic odor. Benzene is less dense than water and is slightly soluble in water. Hence it floats on water. Benzene vapor is heavier than air. Benzene causes central nervous system damage acutely and bone marrow damage chronically and is carcinogenic. It was formerly used as parasiticide. Benzene is present in crude oils and is a product of oil-refining processes. There are limitations on the content of benzene in gasoline. In industry benzene is used as a solvent, as a chemical intermediate, and is used in the synthesis of numerous chemicals. The phase diagram of benzene is shown below the table. as well as Thermophysical properties of: Acetone, Acetylene, Air, Ammonia, Argon, Butane, Carbon dioxide, Carbon monoxide, Ethane, Ethanol, Ethylene, Helium, Hydrogen, Hydrogen sulfide, Methane, Methanol, Nitrogen, Oxygen, Pentane, Propane, Toluene, Water and Heavy water, D2O. Benzene is a liquid at standard conditions. However, if heated it becomes a gas, and when cooled it becomes a solid. 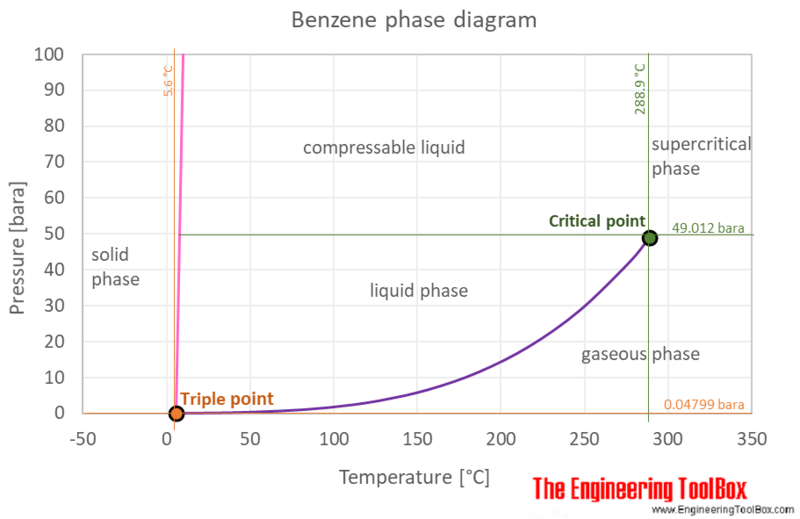 The phase diagram for benzene shows the phase behavior with changes in temperature and pressure. The curve between the critical point and the triple point shows the benzene boiling point with changes in pressure. It also shows the saturation pressure with changes in temperature. Engineering ToolBox, (2018). Benzene - Thermophysical properties. [online] Available at: https://www.engineeringtoolbox.com/benzene-benzol-properties-d_2053.html [Accessed Day Mo. Year].